There is absolutely nothing more comforting than a piece of chocolate cake at the end of the day. I always feel good when I know that a chocolate cake recipe is sitting in my fridge. Here is one delicious plain chocolate cake recipe that I love to bake and would make it every day if I could. This recipe uses Coca-Cola to give it a dark color that is difficult to resist. – Grease and flour a 13×9 inch cake pan. – In a double boiler, melt the butter and chocolate. – Add the Coca-Cola and bring to the boil. – Remove from the heat and stir in the marshmallows. – Stir to get a smooth mix (the marshmallows melt). – Let it cool to room temperature. – Use an electric blender to blend the eggs and sugar to get a fluffy mix. – Add the shortening, oil and vanilla and beat some more (for 2 minutes). – Add the buttermilk to the above mix and blend well. 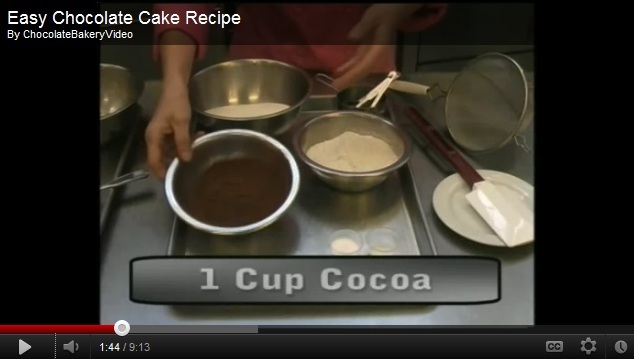 – In a dry bowl, mix the flour, cocoa powder, baking powder and baking soda. – Add half of this mixture to the egg-shortening mix and blend well. – Now add the Coca-Cola mix and stir well to get an even mix. – Make sure that you scrape the sides of the bowl to blend all the ingredients. – Now add the rest of the flour mix. – Do not worry if the batter is thick; it will turn out to be perfect. – Pour the prepared batter in the cake pan. – Bake in the preheated oven at 350F for 35-40 minutes. When a skewer inserted in the cake comes out clean, the cake is ready. – Remove from the oven and cool. – Mix the butter, cocoa powder and Coca-Cola in a saucepan. – Heat over medium heat and bring to the boil. – Remove from the heat and pour over the sugar. – Add the vanilla and pecans and stir well to get a thick spreading mix. – Spread over the lukewarm cake and let it cool completely before cutting in slices.